Below are edited excerpts from an article on Bob Hatch originally published in the Fall 1991 issue of Bates Magazine and written by Ron Meldrum. Hatch died on Feb. 13, 2010. In four decades at Bates, Director of Athletics Robert Hatch, who retired in June, has seen many changes. But he considers the gains made by women to be the most gratifying. When he came to Bates in 1949, Chase Hall was considered an all-male building and female students had to eat in Rand. Women could not use Alumni Gymnasium, and their athletic facilities were separate and frequently inferior to those for men. In 1949, men’s sports and women’s sports — the programs, faculty and staff — were entirely separate. So separate were the sexes that staff from one athletic department often did not know many of the staff from the other, he said. 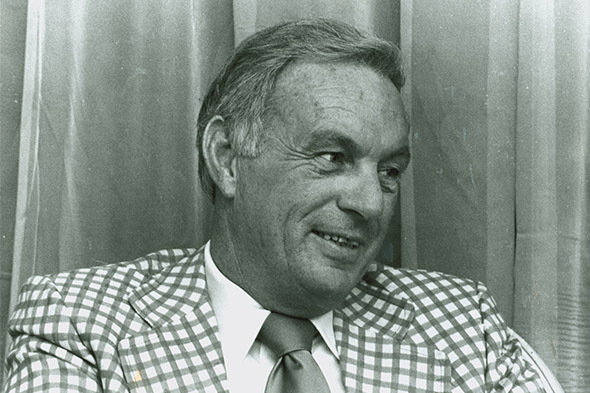 The separation came to an end when, in 1974, President Thomas Hedley Reynolds, under the impetus of Title IX, merged the women’s and men’s athletics programs into one department. Hatch has seen many other changes during his years at Bates as the College has grown. He has watched as new buildings and staff have been added, as well as new departments. But he stresses that although there have been many physical changes, the College’s philosophy has not changed. Bates, he said, has always been ahead of its time in many areas. After the women’s progress, the biggest achievement Hatch has had a part of at Bates has been the construction of Merrill Gymnasium. For years, the athletics facilities at the College were inadequate, so Hatch and other members of the department pushed for a new building. Hatch came to Bates in 1949, giving up a potential professional football career. The Bates job was more secure, he says, and he was looking for security for himself and his young family. He and his family moved into the Sampsonville apartments — they were former army barracks — with other young faculty members. It was a bit of a shock at first, he said, since they had left a new house they had just built in Massachusetts, but they got used to it. But he’s not heading into retirement entirely without regret. He will miss the job he’s worked at for four decades, and the people he’s worked with.